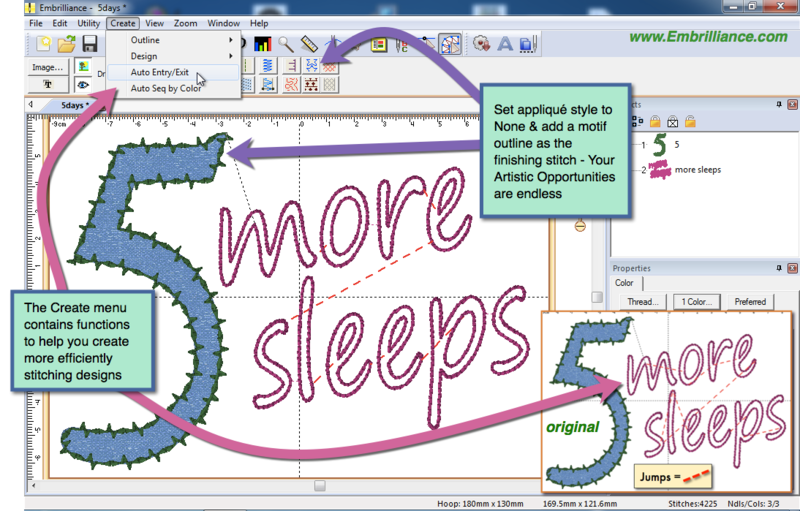 StitchArtist is a program to create machine embroidery designs from scratch. You start using existing artwork or by ‘drawing with stitches.’ You control the shapes, set the stitch type and properties, and StitchArtist generates stitches for you. When you want to create stitches, that’s what it does. StitchArtist embroidery digitizing software was a journey many years in the making, and has been designed for ease-of-use for embroiderers and to promote embroidery digitizing education. The process of embroidery design creation, commonly called ‘embroidery digitizing’, requires a skilled person using a specialized tool. StitchArtist is that tool, but it is designed to take the difficulty out of the software, leaving the user to concentrate on their designs and creativity. 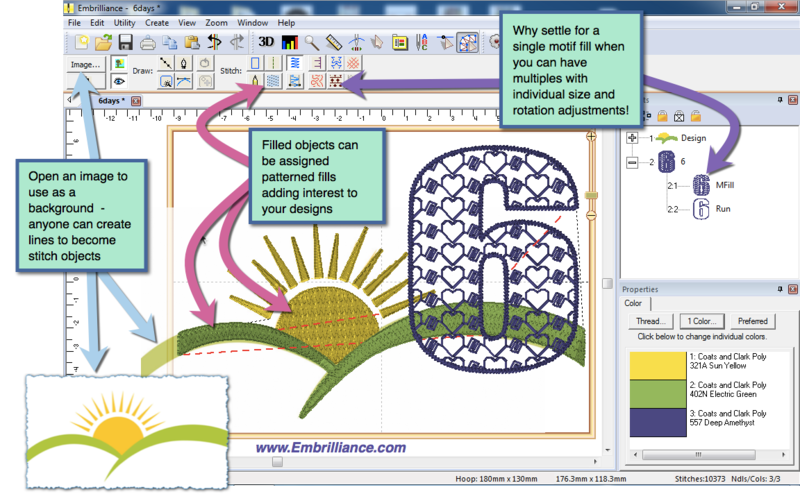 In a radical departure from the typical embroidery digitizing interface, StitchArtist uses a single mode to draw, set stitches, size, edit, rotate, sequence and set properties of design objects. It is easy and intuitive once you know the very basics, which are described in detail in the user guide. 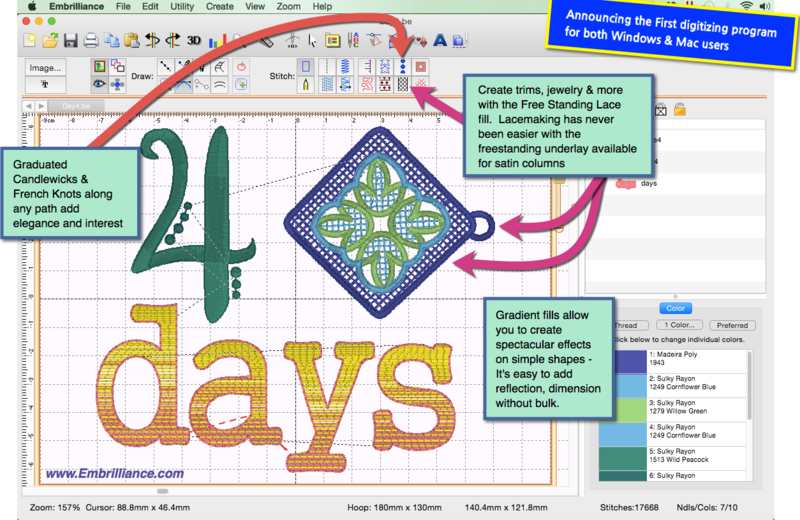 Level 1 is designed for a hobby embroiderer who needs simple digitizing software able to create stitches without going into debt or spending much computer time. Level 1 offers a limited set of stitch types and, more importantly, properties for those stitches, so that the user can simply ‘create’ without needing to learn many steps. Typical projects for Level 1 are applique designs, running stitch designs and simple filled shapes, backgrounds or unifying elements for design compositions etc. Level 2 includes Level 1 and is designed for production and skills training for those who would like to create more sophisticated embroidery designs (logos), as well as a more complete set of digitizing tools. 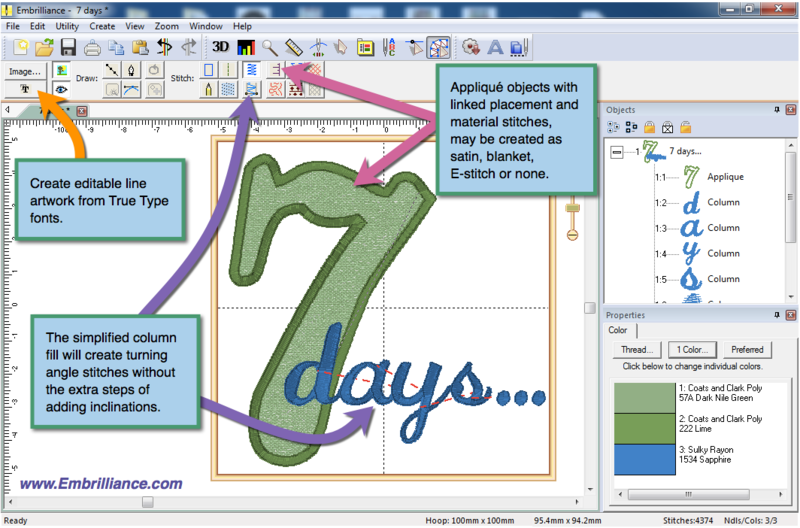 It will allow the user to learn a wide cross-section of embroidery stitch types and properties, and have enough freedom to create virtually any design. If you are looking to use satin stitches to their fullest extent, this is where you need to look. This level allows you to import .SVG vector art and some cutting file formats (.FCM and .studio) for cross-purpose use as objects. 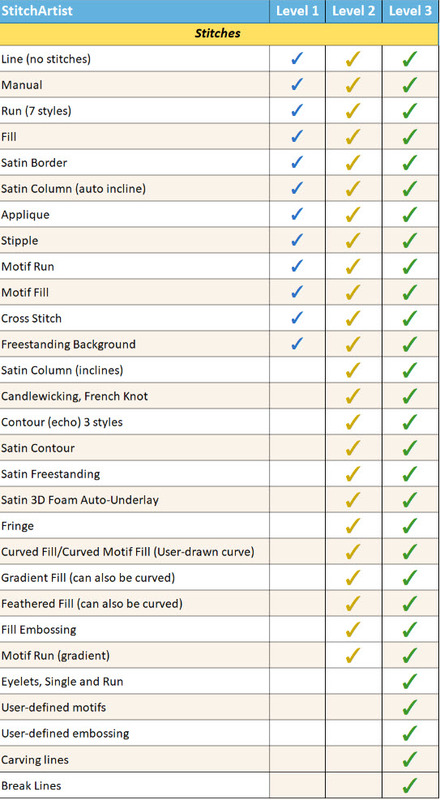 Included is Our World’s-First automatic 3D Foam column underlay type, which automates the process of converting any suitable satin-stitch elements into 3D Foam embroidery with the click of a button! Level 3 includes Level 1 and Level 2 and is designed for someone who either loves to create designs or for a digitizer working commercially in the machine embroidery field. This level includes advanced items such as Styles, QuickStyles, an Eyelet tool, Carving lines, graphical operators such as Cut, AND, Union, Flatten, Inflate/Deflate, Re-construct and Break. It also allows for the content within the product to be expanded by publishing Motifs and Embossed effects. Additional controls are available to work how you like. 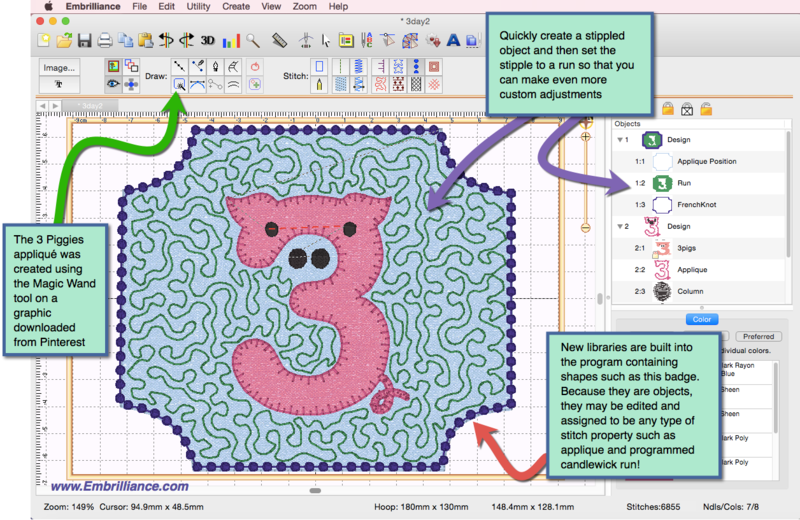 The properties for each stitch type are fully revealed, and operations for vector support, including export, are added; now you can draw .svg and cutting machine designs directly. It offers Branching of all object types including sub-branches that don’t need to touch. 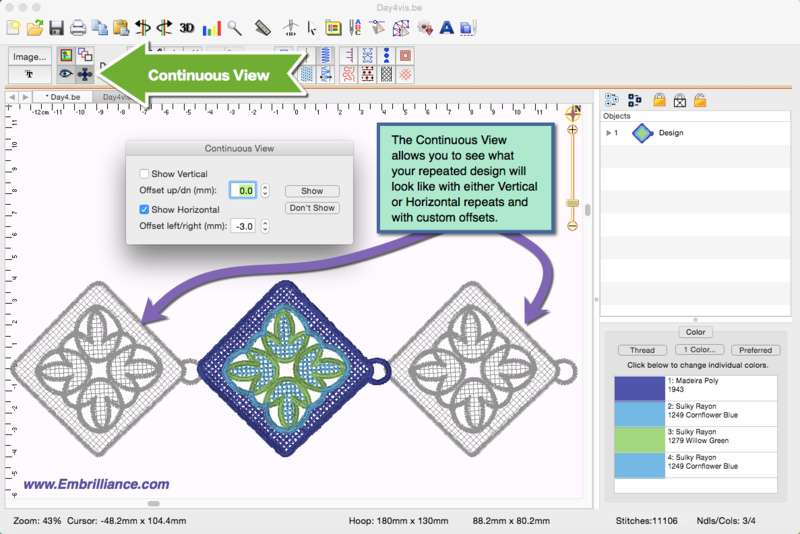 There’s even a tool to automatically outline existing design stitches. StitchArtist is not a photo-to-stitch tool, nor is it an autodigitizing program. The results of those are very subjective, and there are plenty of tools to do those in the market. When we find a process that is good enough for us, we’ll produce it. Meantime, straightforward design creation is the focus of this product. If you want to make designs for hobby, cottage industry or professional use, this is for you. If you really want to learn to digitize, this program has been designed for simplicity and instruction from the ground-up. It is not a customizing tool (used to manipulate existing designs.) It does not contain Essentials or Enthusiast, although it does run within the Embrilliance Platform so the user interface is consistent. You can purchase StitchArtist by itself if desired; it does not rely on any other purchased product, nor is it an upgrade of any other product. 3D Foam automatically adds cutting stitches to ends with caps and joins. Can create subpaths: Objects do not have to touch. "Thanks for doing the SOOOO needed MAC version for home embroidery."